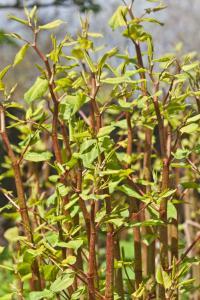 Knotweed (Polygonum spp.) is an enormous bamboo-like plant that is one of the most difficult weeds to control and eradicate. The best treatment is to prevent it from ever becoming established. However, it if you find yourself confronting an existing patch of knotweed, there are a few techniques available to rid your property of it. There are several species of knotweed that are invasive in different areas of the country, but almost every region (other than the southwest) has at least one to contend with. They all look quite similar - the main difference between them is size. 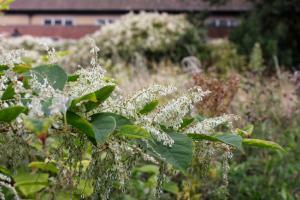 Japanese knotweed grows about a head high and is the shortest of the bunch. 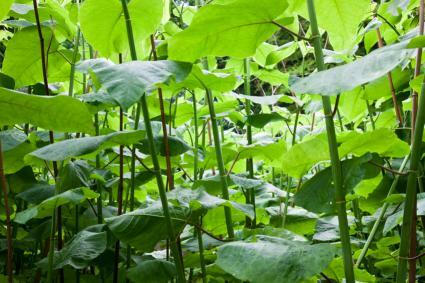 The largest, called giant knotweed, can reach 20 feet in height. Canes - All knotweeds have hollow, segmented canes reminiscent of bamboo. The canes often grow in a slight zigzag pattern and are speckled with reddish markings. Foliage - The foliage is much larger than anything seen on a bamboo plant. The leaves are spade-shaped and range from five inches in length on Japanese knotweed to over a foot long on giant knotweed. Flowers - The flowers emerge from the stems in later summer as lacy white clusters that dangle in the wind. Overall, knotweeds are actually very attractive plants, which is why they were commonly planted by gardeners in the past - the only problem is they don't stay where they are planted. The one place knotweed won't grow is in deep shade. It tolerates partial shade, but is most rampant in full sun. It grows profusely in moist soil and often colonizes areas around water bodies, though it survives just fine in dry soils. Similar to bamboo, the plants spread by thick underground rhizomes and are capable of colonizing large areas, forming impenetrable stands where little else can grow. The aboveground growth dies completely in the winter, but new shoots emerge from the root system each spring, often growing several inches per day. Digging out knotweed by hand is practical only when it covers a few square feet. It's a good approach to prevent a new patch from becoming a huge patch, but within a couple years, a new patch will be too large to deal with manually. If you are attempting to dig out knotweed, it's critical to sift through the soil to get every last piece of rhizome. Monitor the areas carefully afterwards, as any remaining root pieces will sprout and quickly re-establish themselves. Repeatedly cutting back the above ground portions of the plant is the primary method of control. Since you can't mow down a patch when it is already a head high, it's necessary to prepare the area in late winter by removing the dead canes. Then, as soon as the new growth is six inches tall, cut it with a lawnmower. In areas that aren't accessible to mowing equipment, you'll have to cut it manually with hand pruners. It will regrow immediately, but just keep cutting it when it gets six inches tall. Repeated mowing prevents the plants from photosynthesizing, meaning that energy stored in the roots will slowly be exhausted. Unfortunately, it can take years to exhaust the roots of an established patch. So be vigilant and try to always mow the sprout before they form new leaves. Constant mowing will eventually kill knotweed, but spraying it with herbicides will speed up the process. When applied to the foliage, broad spectrum herbicides such as glyphosate, commonly known as Roundup, and 2,4-D (sold under many brand names) travel to the roots and attack the plant at its foundation. The foliage will be killed entirely, but the roots of an established patch will only be weakened a bit. A common tactic is to mow knotweed sprouts throughout the growing season and then let it get tall enough to form a few leaves in early fall, which are then sprayed with herbicide. The fluids within the stems of the plant travel toward the roots at this time of the year, taking a bit of the herbicide with them and making it more effective than spraying at other times of the year. Repeating this cycle of mowing and spraying for several years is an effective way to kill knotweed. Keep in mind that herbicides are poisons and must be used with caution. Always wear protective clothing, gloves and goggles and do not spray in places where the chemicals can drift over a waterway. Read the directions on the label carefully and use only in the recommended concentration. 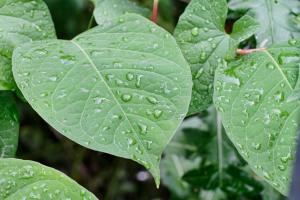 Knotweed is known for breaking though concrete patios in it quest to colonize the ground. Though it seems invincible, it is possible to overcome - it just takes relentless persistence.